Commercial roofing in the Greater Toronto Area takes a punishment from the sun, as well as the 33 inches of precipitation we get each year on average. Draining nearly three feet precipitation a year requires not simply a clean gutter, but a complete, properly built and reinforced commercial roofing drain system. All the parts must work in harmony to shed water that otherwise ends up inside the insulation, roof deck, inside your building and, possibly, inside your inventory. Interior drains handle water in the middle of large roof expanses. A “flat roof” may actually have four sloping segments leading toward an interior drain capped by a strainer. The interior drain empties into a drain pipe that carries rooftop water through the building to empty into a standpipe. Whether your commercial roofing system has interior drains, scuppers or both, when strainers and scuppers clog, water backs up and forms a pond. Some ponding becomes so bad, small trees actually take root. This weight and organic matter can compress roof insulation and lead to water infiltration. Annual or semi-annual inspection and maintenance can prevent clogs and ponding. Just a fraction of an inch of debris damming around a circular strainer can lead to many pounds of water weight on your roof. The architect who designed your commercial property’s roof and drainage system may not have anticipated add-ons, such as HVAC units, skylights, satellite dishes and other units, that can trap and hold debris. Your roof may benefit from having a new interior drain installed. Other methods can divert rainwater around standing obstacles. 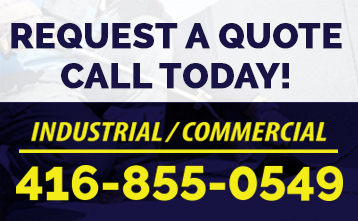 A high-quality commercial roofer can help with these problem areas, making suggestions on improvements to your drainage system and get it running smoothly. 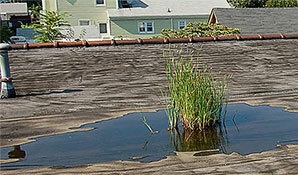 Contact FlatRoofReplacement.ca today to learn how we can maintain or improve your commercial roofing drain system.